THE MASKED SINGER continued to dominate the night. CW: The line-up returned for the first time since December 12, with RIVERDALE up 0.1 to 0.5, and ALL AMERICAN steady at 0.2. 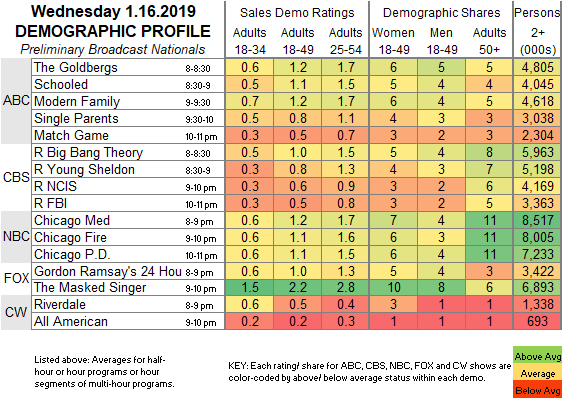 FOX: 24 HOURS TO HELL & BACK (1.0) and THE MASKED SINGER (2.2) were both down 0.1. ABC: THE GOLDBERGS slipped 0.1 to 1.2, and SCHOOLED was down 0.2 to 1.1. MODERN FAMILY lost 0.1 to 1.2, SINGLE PARENTS was steady at 0.8, and MATCH GAME was down 0.1 to 0.5. NBC: CHICAGO MED (1.2) and CHICAGO FIRE (1.1) were each down 0.1, but CHICAGO PD was up 0.1 to 1.1. 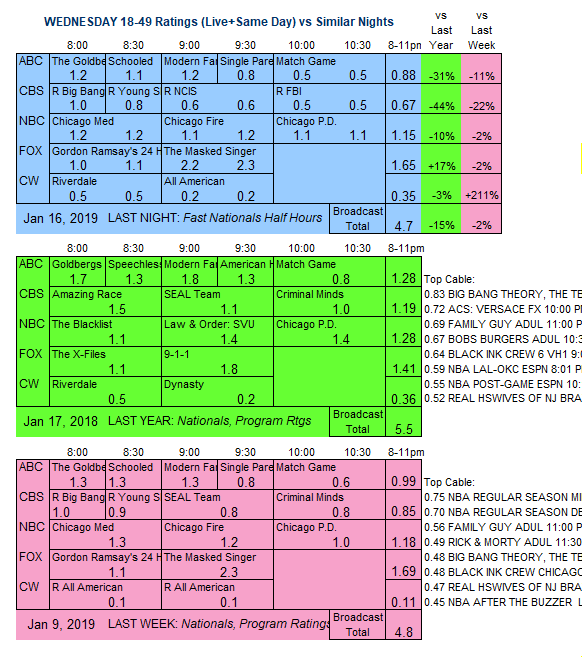 CBS: A night of 0.5-1.0 reruns. ABC’s GREY’S ANATOMY and HOW TO GET AWAY WITH MURDER return tonight, this time with A MILLION LITTLE THINGS getting a bump up to the timeslot between them.